(Lanka e News – 09.Sep.2018, 2.06PM) It is a well and widely known fact President Pallewatte Gamarala who has already broken records after records as the most ungrateful ,cruel, cunning leader replete with all the wicked traits in all the three worlds never hesitates to bite the hand that feeds. His latest record breaking feat in this direction revolves around chasing out Shiral Lakthileke (lawyer) who functioned as his co ordinating secretary and advisor , based on reports reaching Lanka e news. The other officer along with Lakthileke who has incurred the displeasure of Gamarala is latter’s Director General( media) , Dharma Sri Bandara Ekanayake , it is learnt. Shiral Lakathileke ( in spite of his putrid antecedence –NGO crook and a slimy fox) was in charge of a number of projects of the president , and was making cut backs on funds allocated to those projects . Three individuals appointed by Lakthileke for those posts were also dismissed by the president. Lakthileke had been over this issue railing at the president wherever he went , and lately he is in the ready to express his opposition openly against president. Gamarala who became president on the unstinted and wholehearted support of UNP leader Ranil Wickremesinghe , no sooner he secured that post than he with a view to attack the same UNP leader appointed Lakthileke as his coordinating secretary , a vicious and venomous enemy of Ranil in order to fulfill Sirisena’s hidden agendas at that time. 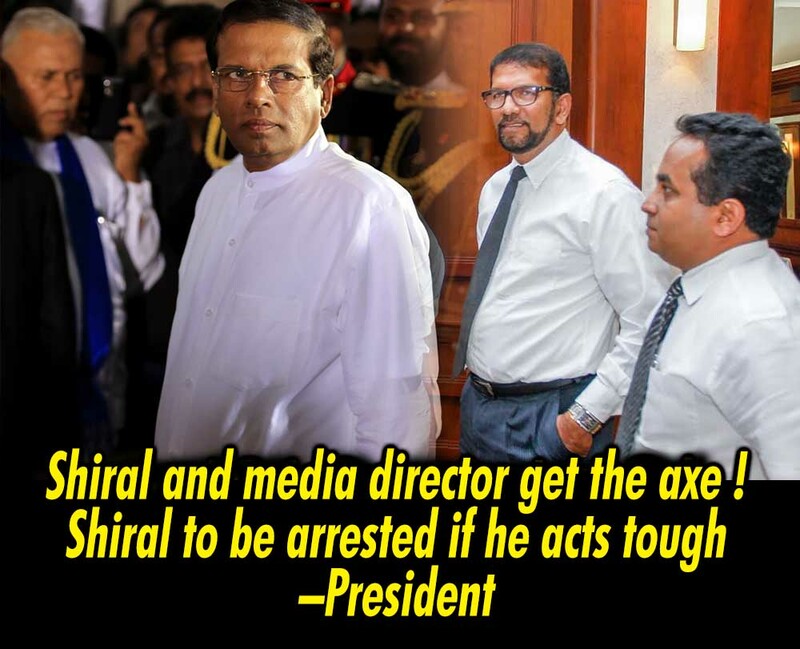 In any event , according to reports reaching Lanka e news , the reason for Ekanayake and Lakthileke to get into the bad books of the president is because they have sold most vital and close secrets of president to the outside. Lakthileke of course has been most famous for such surreptitious activities wherever he worked. It is despite Lakthileka’s such putrid record , Gamarala appointed him as his coordinating secretary. The fury of the president against Lakthileke is so much so that , he has started preparing a dossier of the frauds and rackets of Lakthileke with a view to arrest him if the latter after his dismissal tries to vent his vengeances on the president. What is specially worthy of note is , since Gamarala Pallewatte became the president he had during his three years in office has transferred three private secretaries , three presidential secretaries and three defense secretaries . According to those who know about Gamarala and Lakthileke both notorious for scheming, underhand activities and ingratitude sticking together for so long is itself a record . It is an open secret that Lakthileke and Dharma Sri while receiving salaries from the president were also in the pay of Maharaja and under obligation to him.